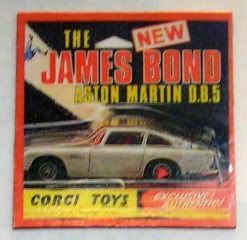 Another one of my Union Square magnets - this one I had in mind for if I ever finally watched the latest Bond flick, or for one of my favorite shows Top Gear. Yeah, let's go with Top Gear, only the best show ever. If you haven't seen it - go find BBC-A, and track it down. Better still, find it on YouTube. The beauty of this show is that everyone can watch it. Now, hang on, bear with me. Really! Everyone really can. I'm totally not a gearhead, but find myself fascinated with the car footage. It's amazing. When you watch, you can see why guys love cars, the sleek lines, the sheen, the revving of the engines. They're just gorgeous machines. But there's also the coolness of the guests - seriously, where else would you find Helen Mirren saying that she sets her alarm early so she and her hub can have some alone time. The first I ever saw of the show were the three hysterically funny Doctor Who interviews (Christopher Eccleston, Billie Piper and of course, David Tennant), and I was instantly drawn to the lap time competition. You also have to love all three presenters - Jeremy Clarkson, James May and (no, he doesn't really look like David Tennant), Richard Hammond. Whether or not they're RL chums, they certain get on well on camera, and they make you want to hang out with them. Or rather, they make you want to compete with them, in one of their wacky races. Remember the Wacky Races cartoons? Just like that. Whether it's across the deserts of Africa, the traffic of London, the country of Vietnam or the superscary backwoods of the US, you just want to go along for the ride. And, luckily, we get to. I’m sorry, but having an Aston Martin DB9 on the drive and not driving it is a bit like having Keira Knightley in your bed and sleeping on the couch. So, this guy - or actually, gal - came from a friend and colleague of mine during his trip to Japan. 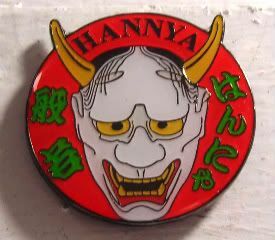 It's a Japanese nō theatre mask, with two horns, very mean eyes and a giant scary mouth from ear to ear. Freaky deaky, I know. Supposedly it represents a jealous female demon - she was soooo jealous that she grew those horns. Huh. Ok. The sad part is that I can't even tell you what the rest of the writing is on the magnet, despite taking Japanese at school. I only took it under extreme motherly duress - she was convinced that I should learn Japanese, so that I could do business in Japan. In the end, I took those three ill-fated semesters of Japanese in college. Which meant, every Friday, I had a katakana/kanji quiz. Ugh. Oh, I loved writing the characters. Loved. They were so pretty and fun drawing them! It was when I had to actually associate them with words and speaking that I had troubles. Good gravy, those were some of the hardest semesters at Chapel Hill. I hated it. And guess what, Mom wasn't wrong - my first advertising client was NEC, whose headquarters were in Japan. 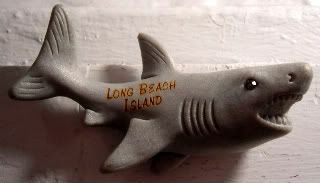 Oddly, my clients were actually based on Long Island, so I rarely had to interact with their headquarters. But, having not retained one word of it, it was about two years or so on the account that I even confessed that I'd had Japanese in school. Here's another weird thing...that same friend/colleague? I lost touch with him after freshman year, as you do. But one day a couple of years ago, I was sitting at my cube minding my own business, and my chairman rounds the corner and introduces us, saying that we had to get to know each other since we were both big Tar Heel fans. And it was a good two minutes before I placed him to JAPN101 at Chapel Hill. See, that kind of thing happens when you go to smaller schools. But when it's a school of 22,000 kids in NC, you don't often expect former classmates to randomly pop up in your cube in NY. 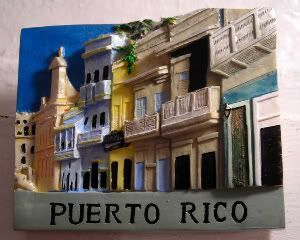 Here's something weird - whenever I think of Puerto Rico I think of that one travel commercial with Ricky Martin where he says, "WELcome to PUERto RIco!" But now, I'm wondering if it's one of those false memories, particularly as I can't find the vid on YouTube. Hmmm. No one else remembers that commercial? Of Ricky in white linen, looking all hot and poetic justicy? I think I'm just having one of those days, because I also can't for the life of me figure out who gave me this magnet. So if it's you, thanks very much! I picked it because - and this won't surprise you in the least - I watched Disney's Princess Protection Program last night. The one with total (or Disney hype'd) BFFs Selena Gomez and Demi Lovato - filmed entirely on location in Puerto Rico. About the princess of Costa Luna (Demi) who had to be relo'd to the backwoods of Louisana with a covert agent and his daughter (Selena), and the trials and tribulations of a modern-day princess trying to blend in as a typical American teenager. Adorable concept. What? I love DCOMs (Disney Channel Original Movies). They're great fun, you don't have to think about anything, they don't solve the world's problems, and every once in a while they make you sing. But, there's a caveat to my DCOM love. It's basically anything pre-High School Musical. For some reason (other than singing a couple of their songs), I'm not on the HSM bandwagon. In fact, I didn't even really like Camp Rock all that much (which didn't stop me from buying the Camp Rock Band-Aids, but that's a whole other magnet, methinks.). Yep, my favorites of the bunch are several years ago now, but movies like the Zenon series - the ones with pre-soap diva Kristen Storms, where she's a preteen in outer space, living in a spay-stay. Or, the one with pre-grown up Ryan Merriman, Luck of the Irish, about a basketball player who finds out he's half-Leprechaun. I know! It's crazy! Up until last night, I would have said it was a function of me growing older (finally) and not liking the newer movies, but Princess Protection Program was kinda cute. Silly, but cute. And, they didn't solve anyone's problems, you didn't have to think too hard, and if I watched it more than once, I'd probably start singing the soundtrack. Of course, it didn't hurt that cutie Tom Verica was in it, playing the covert agent dad. The one thing that I was absolutely in awe of the big Disney machine over, was the part where the whole thing centered around the concept of princesses...and how it's not about what you are, but who you are and what you can offer to the world. It dawned on me that they were totally adding another level of substance to their own Disney Princesses empire. Whoa. C'mon, that's sheer genius. 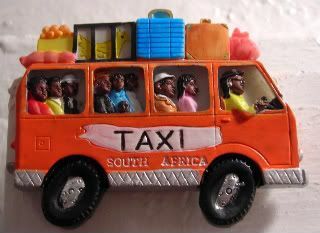 I bought this one from that magnet vendor down at Union Square. 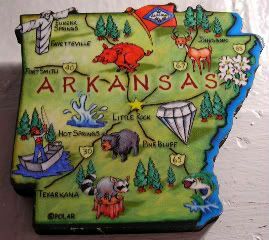 How cool is this magnet! I mean, it's the epitome of cool with awesome Cary Grant on it. 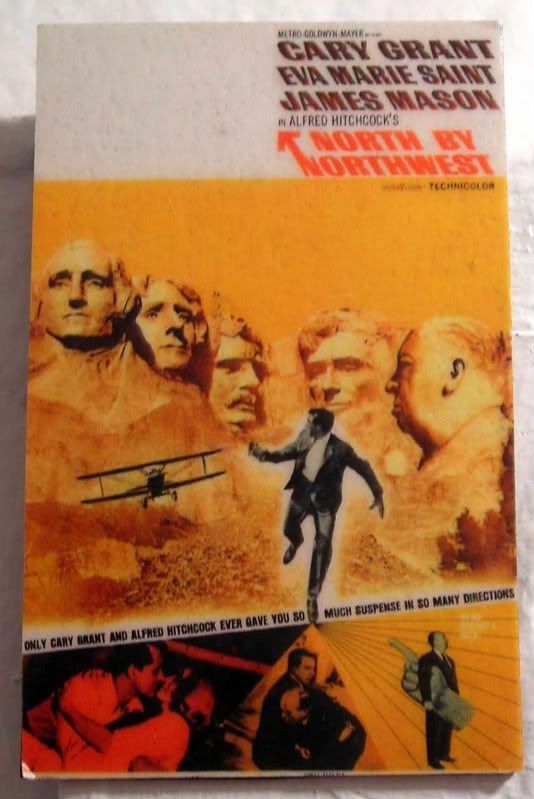 I'm actually watching North by Northwest right now, as I type. TCM's running a daylong Hitchcock marathon. Yay for TCM marathons! This one's never been one of my favorite Hitchcock movies. I always lean toward the obvious Vertigo and Rear Window. But, as I'm rewatching it, I'm finding myself looking at it with new eyes. I just did a tour of The Plaza, and that's where Roger Thornhill was abducted. I just went to the Frank Lloyd Wright exhibition at the Guggenheim, and though the house at the end wasn't a FLW house, it was certainly done in his style. And on and on...in the end, I do find myself liking this movie even more. Funnily enough, I've had the magnet a few months now, and only when I started to take a picture of it today did I notice there was a fifth head up on Mount Rushmore! Hahahahaa. That Hitch, he's a nut. A friend of mine gave me this wood cut magnet. LOVE! I've not been to Yosemite, but one of my sister's best friends is a park ranger there. Or maybe it's Yellowstone? Eh, either way, the magnet's supercute, and after a week of ups and downs, highs and lows, nooks and crannies, I'm glad to be sitting here at home on a Friday night finally in relative quiet. 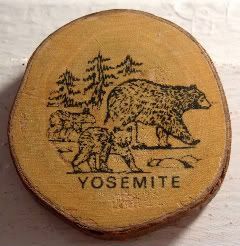 Though, honestly, I might would rather be out in Yosemite right now, with these guys. Of course, it'd be hard to drag my laptop, wireless, TV, DVR, cell and blackberry along with me. Hahahaah. This is one of the magnets I bought from the Pomegranate folks at BEA, who licensed it from M.C. Escher estate...it's his lithograph called Cycle. I know next to nothing about M.C. 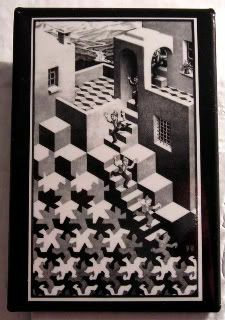 Escher, and it's kind of a shame, but my earliest memory of his work was seeing them as dorm posters on sale at the stationery store on Franklin Street in Chapel Hill. But from what I gather, he's known for his lithographs and woodcuts and mezzotints - mostly mathematically inspired. Well, that's my problem right there - math does *not* equal joy. Heh. Apparently, he's also known for his work being impossible constructions, with wonderful architectural explorations in planes and infinity. Supercool - I suppose one could spend hours just looking into one of his works. Oddly, I wondered why I hadn't seen his work in any galleries, so I looked up where his work is, and it seems to be spread around the world - the Escher Museum in The Hague, National Galleries in DC and Ottawa, Israel Museum in Jerusalem, the Huis ten Bosch in Nagasaki, and the Boston Public Library. Looks like he's my next artist exploration in DC. Heh. I particularly like this Cycle piece because it closely matches my mood of late. When I was young, people used to talk about the rat race, and I had this image in my head of people all over the world (on different time tables), waking up, leaving their houses, getting into their modes of transit, working their jobs, coming home, going to sleep, and starting all over again - en masse, like little drones. And nothing ever got accomplished, really, no real goal except to clock the most mileage on our little human bodies. I just realized that this image closely resembles my vision - the little guy leaves his house at the top of the stairs, and as he descends, he slowly loses his individuality, and joins the dozens of carbon copies of the 2-dimensional figures at the bottom, with his house behind him, and the real (3-dimensional) world of nature behind his house at the top of the magnet. This work is called Cycle, I suppose, for a reason. So imagine...this little guy in this painting does get to go back up the stairs every day, back to his home and family and become a 3-dimensional guy again...and I bet, every once in a while, he even leaves his house from the other side, and gets to go frolic and play in the hill and dale behind his house. Yes. I said frolic and play. Tonight's the premiere of NBC's The Philanthropist, which they premiered last night at the Paley Center, complete with a cast/production team panel (which I loved) and an exclusive afterparty (which of course I didn't go to). I love going to these events at the Paley, because you just never know who is going to show up in the audience. Last night's surprise was Sting. No. Seriously. Just walked right on by us. Here's something - we have no proof. No one has any pics of him (yet), and he didn't do the tiny little red carpet with the 'razzi corps. So now I'm second-guessing if it was him. (Of course, it was.) Other people were there as well - Julian Schnabel of Diving Bell/Butterfly fame, a ton of network execs, and Paley stakeholders. You know it's big when they reserve the entire center of the auditorium for special guests, and leave the riff-raff members to fend for themselves. We screened the pilot of the show, which is based on the philanthropy of this real-life guy Bobby Sager who spends 10 months out of the year, striving to make real change in this world. And that's what James Purefoy's character does - he gets tired of the little that he can do with his money, and he goes out in the world to help people, really help them. Not surprisingly, I'm totally on the fence about this show. I like James Purefoy a lot, but I'm not totally sold on his character, Teddy Rist - there's a smugness in Teddy that I don't like, but it will be interesting to see if they continue to have his character journey match his physical journeys. In other words, how much his character will grow with each new situation he helps with. To be honest, there's a part of me that wants to see if Teddy ends up wearing (with a suit) the funky lime green converse high-tops that Mr. Sager was wearing last night. Very Doctor Who-y. Hee. But mostly, I had real issues with the VO flashback exposition...that's a function of the pilot, I know. So hopefully they move away from that format in the next seven episodes. (They have eight in the can.) It was fairly well written, and it did keep me entertained. Some of it was over the top and melodramatic, and some was a little teary. Oh, let's face it. We all know I'm going to end up watching it, no matter how many critics pan it, or love it. It's summer. It's pretty. He's pretty. So, yeah. Totally watching. Come. Join me. OMG! I forgot the biggest, most relevant to my job, part of last night's pilot! The integration of bing.com for their global navigation - kinda like how Doctor Who closes in on Earth and zooms in? Yeah, just like it. There's a part of me that thinks it was very cleverly done, because God help me, by the end of the episode, I actually waited for bing's logo to pop up in the corner. Then, there's the other part of me that knows it was a blatant sell, and was annoyed by it. Then, there was the other part of me that grudgingly and somewhat jealously applauded the terrific marketing team on both ends (NBC/show/agencies/bing) that brokered the deal. Confession. I'm not a big Breakfast at Tiffany's fan. I'm sorry. I know, I'm a girl, a girl in New York City - I'm supposed to revere offbeat characters like Holly Golightly and Carrie Bradshaw. In fact, not liking Breakfast might actually make me inhuman. Oh, I know Holly's supposed to be all quirky and daring and brave, and then by herself, she's the complete opposite, and it takes the love of a good, if slightly befuddled, man in the shape of George Peppard to make her truly shine. I get it. And yet, still, I've never been able to identify with this character. She drives me insane. She's gorgeous, though, no one can argue with that. I picked her for today, because first, the song Nothin' like a Dame has been rolling through my head all morning - not that it has anything to do with Audrey or Holly or the movie. It's just that South Pacific's playing here in town, and the commercials are incessant, and it's always that song. 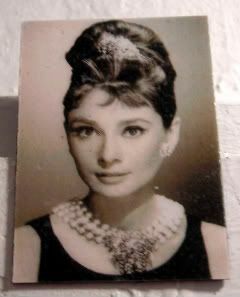 But second, Holly Golightly reminds me of all the funny girls in New York City. The ones who are obviously wearing skirts they know are too short for daylight, because they keep surreptitiously pulling them down. Or the ones who are clearly wearing stilettos too high, because they're walking funny, and desperately avoiding subway grates. Or the ones who are standing outside the fashionable restaurants - switching out one pair of flip-flops...for another pair of flip-flops. Don't get me wrong, I've been accused of all three. But today's target is the cutechick on the train this morning. The one who was standing in the center of the train, with her cute blousy outfit and tights, her hair carelessly, yet artfully, tossed at her nape, her giant designer bag and shopping bags creating a wall around her tiny frame, taking up entirely too much room. The one who, while everyone else was smooshed up against each other trying not to fall over, nonchalantly looked in her giant compact mirror and applied her mascara (three coats each! ), then put that away to get out her smaller mirror compact, so that she could apply her blush and lipstick. Half of the train watched her, both in wonder and annoyance at her ability to not even hang on to the bar. Well, I guess Holly was right - "I mean, a girl just can't go to Sing Sing with a green face." Yes. 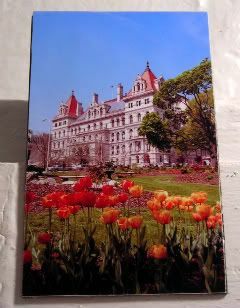 I totally took a tour of the NY State Capitol, and it's a freakin' awesome building. It's gorgeous - inside and out. Flashback: Back in junior high and high school, in our civics classes and as part of the Sheriff's Blue Ribbon Committee (wherein they take not at-risk, honors kids and show them the ins and outs of the judicial system), we got to do one or two mock trials, and got to visit the courtrooms of Salisbury, NC, and learn, well, the ins and outs of the judicial system. To my parents everlasting disappointment, I didn't become a lawyer. But, these classes and tours instilled a great need to do my civic duty. Jury duty. I've been in NY since 1995, and in that time, I've been called exactly three times. The first time, I was totally excited. I served two of the three days, and they picked me to sit in the oh-so-cool jurors box. The attorney/prosecutor (whomever he was, he was supercute) asked us questions, and they didn't select me. I think it was the "Pick me! Pick me!" gleam in my eyes. The second time, I was excited again. I served a couple of the days again, and they again picked me to sit in the oh-so-cool jurors box. The attorney/prosecutor (whomever she was, she was kinda scary) asked us questions, and they didn't select me. I even tried to play it cool, answering questions as honestly as possible, and trying to keep the "Pick me! Pick me!" gleam from my eyes. Present day: So, today...today! I get there, and I'm all excited, because man, it was GRAND JURY for the SUPREME COURT OF NEW YORK!!! So I get there, and we go through the rules and procedure, and how if we got selected to serve, that we'd have to report from 2-5pm every day from June 22 through July 17. I know there was a "Pick me! Pick me!" gleam in my eye - but it didn't matter, because they picked names out of a little draft barrel! Gah! I didn't get picked! Four jury pools were selected, and I still didn't get picked! Sigh. I'm so very, very, very disappointed. But, I'm kinda disappointed in Americans today...or, at least some of the folks in the (kinda cool but dingy Art Deco) courtroom today...everyone has an excuse to get out of jury duty. C'mon, people. Here's what I don't understand...it's our freakin' civic duty. The Constitution, people! It guarantees that whomever's been accused of a crime, has the right to a trial by an impartial jury of their peers. Dudes! Why are ya'll trying to get out of it? People fought and died so that we'd be able to do this. Dudes! There are people out there still fighting and dying out there to be able to have some sort of semblance of same! Okay, okay, fine - some of my ire is really just sourgrape-ing about not getting picked. But, still. I just don't get it. Oh, well. There's always next time. So my sister went on this Jane Austen pilgrimage to the UK last year, stopping by several JA sites such as this one, Chatsworth House. Jane Austen's World has a great blogpost on this particular house and its fountains. If it looks familiar, it should - it's been used in several movies over the years, including the latest re-do of Pride & Prejudice with Keira Knightly and Matthew Macfadyen (versus the original!recipe, best all-around adaptation, with Jennifer Ehle and Colin Firth). 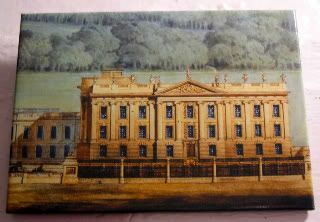 Supposedly, Chatsworth is the house that Jane Austen based Mr. Darcy's Pemberley on in Pride & Prejudice. 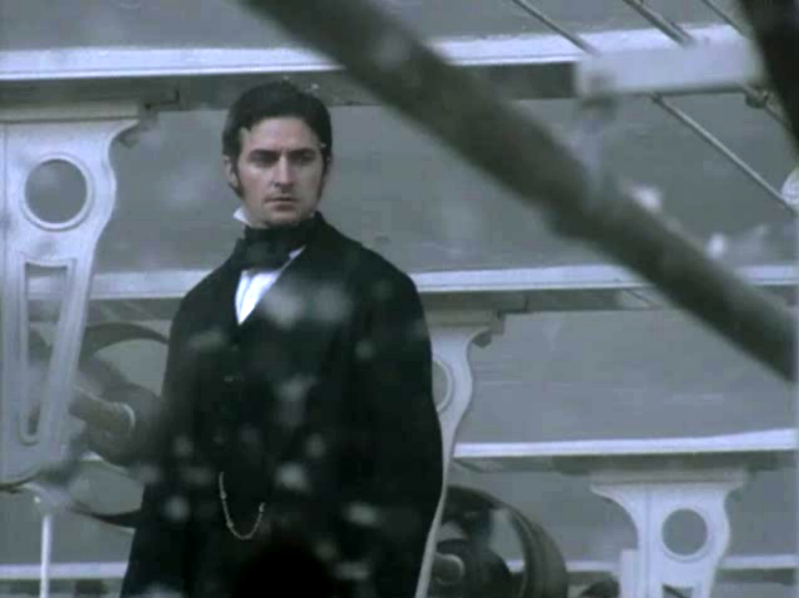 One day about four years ago now, on a lazy weekend afternoon, I was flipping through channels, and stumbled on this BBC movie on PBS called North & South. No, not that North and South, as I've magnetblogged before. I was completely enchanted. I don't think I moved from the sofa. For four hours. Straight. Because it's awesome. It's a fabulous love story (minus the Bennett henhouse), set against an interesting background of the Industrial Revolution. 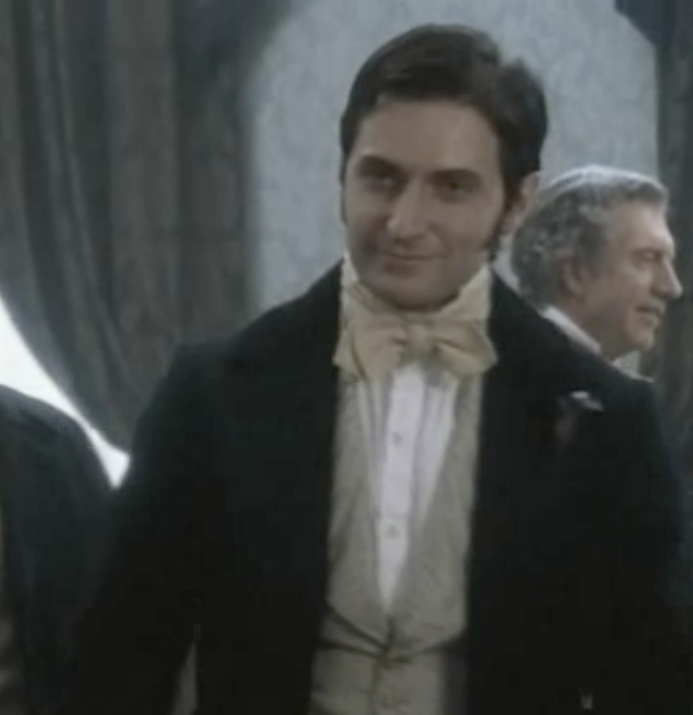 The hero is the one man who could possibly best Colin Firth's Mr. Darcy for best romantic hero ever: North & South's John Thornton, as played by Richard Armitage. In addition to one of the greatest movie-ending lines ever, Mr. Thornton gets one of the best hero introduction scenes - ever. You'll find yourself holding your breath in the moments just before...well, both scenes, actually. Or really during any scene with he and Margaret. It definitely has one of the most angsty proposal scenes ever - again, here it is. The ending is arguably the best romantic movie ending ever - here it is, if you want to be spoiled, but it won't make much sense if you haven't invested the other 3 hours and 55 minutes. And, finally, it's probably the only miniseries that could spawn a marathon 5-hour, 32-page, global, cross-locational (NY/Boston/DC/Las Vegas/Beijing) simulpost session between five women, who for the most part, haven't even met each other, but have bonded over an irrational love of screencaps, trains and train stations, all things Fanny and Higgins, numerous cups of tea and handshakes, rewinding the good parts, fugly pants, and most of all, Richard Armitage. Goodness, if you haven't seen it, and you love Jane Austen (or hell, even if you don't), get thee to Netflix now. As my sister says: "It's like Pride & Prejudice! With cotton!" Have ya'll seen those super, super, super, silly, silly, silly Shark Attack movies? Where something's off about a shark (or two) off the coast of [insert country here], and [insert hot guy scientist here] has to find out what's going on and eliminate the threat - parts one, two and three. Three even has a Megalodon! Hahaa. You might ask why I've ever bothered to watch. (You might actually ask why anyone bothered to make not one sequel, but two.) I never watched Shark Attack with Casper van Dien, even though he was hot. 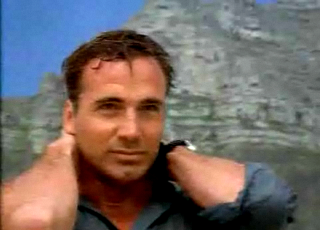 But I own Shark Attack 2, because it has Thorsten Kaye, the superduper hot guy from All My Children. 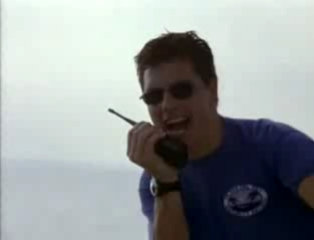 And of course, I had to Netflix the third, Shark Attack 3: Megalodon, has superhot John Barrowman, who all but admitted that he did the movie for the money. Hahahaa, it's truly amazing what I'll watch - and own - all for the love of a hot guy. This magnet's kinda scary, though - lookatit's teeth! Grrrrr. Hmmm, I wonder if sharks actually growl. I'm probably committing some sort of artistic sin or something, quoting one artist to talk about another...but this Paul Klee quote most accurately sums up the works of architect Antoni Gaudí. 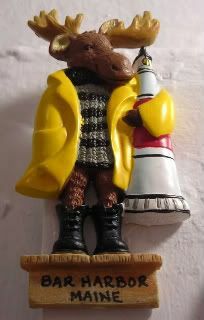 If you haven't seen any of his work, Wiki leads you here, to his list of masterworks, all of which are superduper cool. And, from what I've heard, they're absolutely amazing in person. Judging from the images I've seen, I honestly think the man couldn't draw a straight line to save his soul. And it's wonderful. But, I've already blogged on Gaudí before, talking about with my Casa Batlló magnet that my sisters brought back for me from Spain. I have to be dead-on honest here. I hated it. I disliked it so much, that halfway through, I was convinced that I wasn't a Gaudí fan at all. But my sisters convinced me that it was the documentary's fault, not the work itself. Dialogue. I'm not talking about the conversation at the 29:57 mark. Or the interview at the 59:46 mark. I'm talking a narrator who gives me more information about who Gaudí was, as a man, as an artist, as an architect. Someone who gives the person context. Supers. While I recognized some of the work that I was looking at, there were no captions naming the building. A simple super on the screen would have helped, so I wouldn't have to keep looking through my books and online to figure out what the hell I was looking at. Oh, I know there's a whole second disc, which apparently has the bio and other pertinent information. And, I know there's something to be said about letting the gorgeous work speak for itself, i'm sure. But, I just didn't like this film. In fact, I can't believe I was going to pay for a ticket to the swank arthouse art deco theatre here in town that's been showing it. Sorry, Paris theatre, but I'm glad I Netflixed this bugger. Huh. I can't believe I'm panning a documentary produced 25 years ago. It probably makes me somewhat of a noob for not liking it. But GAH. I'm just so disappointed! I wanted to learn more about the work. It's nice to see gorgeous cinematography, really, it is. It was seriously beautifully shot. But honestly, I could have just watched some kid's Gaudí fanvid on TV with stills and weird transitions and misspelled titles and gotten more out of it. As it was, it was like my sister said...it's like those stupid HD "shows" where they lay dramatic music against images of sunsets and sunrises in California, or wherever. That's not a documentary, that's not programming, that's not a show - that's a screensaver. Ok. Here's something. I just read some of the Netflix comments. You'll not be surprised to know that I am apparently a big old noob for failing to appreciate one of the greatest Japanese documentarians known to man, and the scoring by one of the greatest Japanese composers known to man. I have no excuse. I tend to disregard online comments until I'm done with something...kinda like how author quotes on books mean nothing to me when making a purchase decision. But really, even knowing now that it's my own failing doesn't stop me from wishing I had my time back. I had been despairing of actually finding a magnet during that Tampa trip, and when we made this pitstop, I totally snagged this from their little basket. VSP is a vision insurance company, who sends this motorhome out on the road to help provide vision screenings for those who need/want them. It's crazy tricked out inside - from the examination area to the frame selection area, to even a small little waiting room. Dudes. No lie - they even have a Twitterfeed. Or three. If you see it rolling by, definitely check it out. They have good pens, too. Hahahah. So, here's my thing...I'm so very sad that Angry Little Girls doesn't produce magnets, especially because they have such darn cool stuff in their little shop. That's why I made this one, along with several others from a postcard that they put out at the Licensing Show last year. I love these guys. 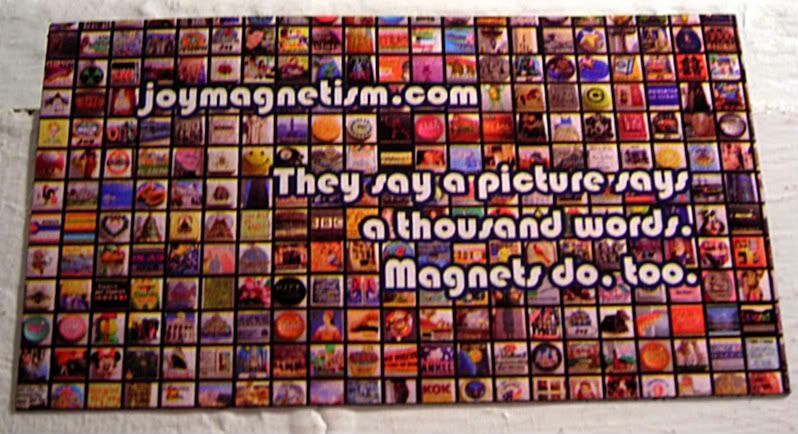 But I would totally give up my homemade magnets for officially licensed products in a heartbeat. I'm just sayin'. 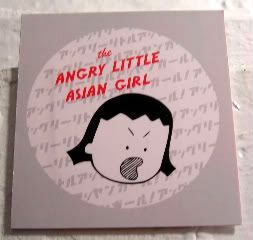 Anyway, you've seen most of the magnets by now, but I saved this one for something that's just made me an angry little Asian girl!!!! And, it's totally irrational, I know. It is. I admit it. Apparently, the breaking news in the entertainment world today (through Twitter and BBC-A...even though I always rely on blogger critic Televisionary for my hard news), BBC America has announced their official line-up for ComicCon in July. Freakin' Russell T Davies, Julie Gardner, Euros Lyn, John Barrowman and Ten, himself, David Tennant, will be there. In San Diego. In California. In the United States. In July. Mind you...I've already seen Euros at New York's CC. I've even seen John Barrowman, albeit almost 20 years ago during his turn at Sunset Boulevard. And, I don't really need to see the affable RTD in person...and Julie's delightful enough on the DWCs. But let's be honest, folks. I'm the girl who joined the RSC to get a Hamlet ticket, and then planned a whole unplanned London trip to see David Tennant. And then didn't get to see him. And now I'm missing him at ComicCon. In San Diego. In California. In the United States. In July. Gah. Oh well. Yet another missed opportunity for my Doctor and me. I'll wave at his plane as he flies over me. No worries. He'll eventually do Broadway. He must. Maybe he and my Lee Mead will do a show together. But he's another magnet entirely. 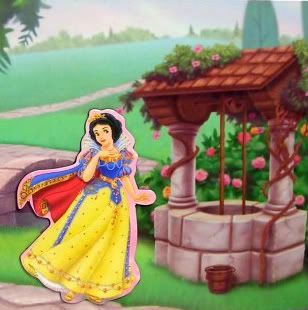 So, I already explained where I got this Snow White Disney Princess magnet...yay for Target $1 aisle! When I first moved to New York, I lived with my aunt and her young family for about 3 months, while I got acclimated to the big city, and looked for gainful employment. I slept in the daybed in the living room, which meant every morning, I could tell what time it was by the sounds of Nick, Jr. (bum-bum-bahhhhhmp!) and Gullah-Gullah Island. It was a fun few months, mainly because I had a blast living with my cousins at the time, a five-year-old and a two-year-old. Thank goodness it was before the Disney Princesses had started to become the huge branded machine they are now. Back then, all we had were the big honkin' VHS tapes in the white plastic collector cases. The best part was the toddler who looooooooved Snow White and the 7 Dwarfs. Actually, that's not true. She loved Dopey. Seriously. Her mom would be headed off to work, the little girl would cry and cry and cry, until we'd sit down on the white wicker rocker and turn on Doooo-pey! Dooooo-pey! Again. Totally adorable. Never mind the fact that that two-year-old is in high school now, and I haven't watched Snow White since. Heh. Anyway, I picked this one for today's magnet, because I found this photographer, Dina Goldstein, who did a whole series on Disney's Fallen Princesses. It's a slightly disturbing, but very interesting photo series that's apparently two more away from being complete. I just loved her interpretation of poor Snow White, after her happily ever after. Away to his castle, indeed. Ya'll know I have a thing for visiting national parks, and historic places. A couple of months ago we visited Fort McHenry, in Baltimore, MD. It was always one of those placesigns along I-95 that you just drive past on your way north or south, and you just never stop. This time we did. Here's the thing. You grow up with the national anthem, the American flag (and apple pie, I suppose), but you don't necessarily think about from whence they came. So to see the flag flying, and to stand in the very fort where the star-spangled banner waved, and to walk o'er the ramparts, is something pretty cool. That same weekend, we also went to the newly renovated Smithsonian National Museum of American History in DC, where we could see the same flag from the song. And you think Fort McHenry was cool, seeing the actual flag itself is even more awesome. Both places gives you more historical context more than any history book ever could - so it's highly recommended. The flag itself and the journey it's been on since the War of 1812 is quite extraordinary. You can learn more about it through the Smithsonian's fabulous interactive demo - definitely check it out. I love this magnet because it really shows a couple of details that I find fascinating. 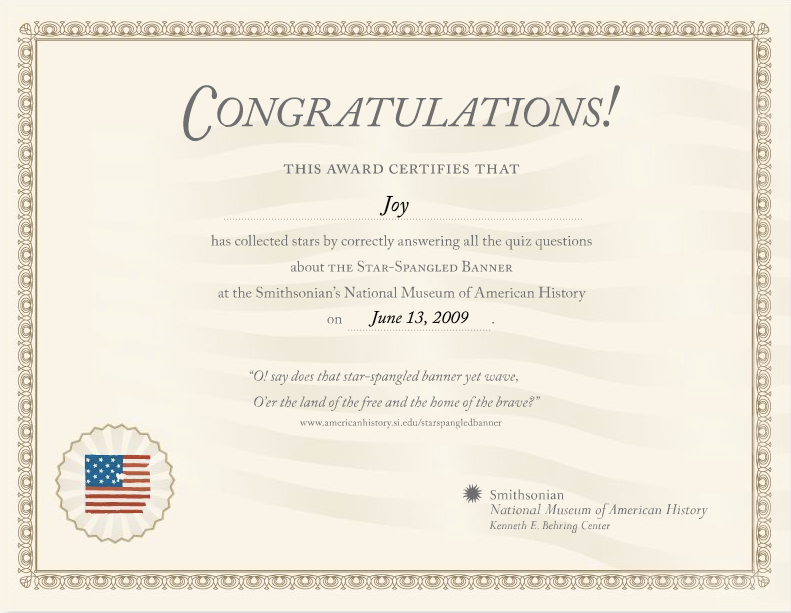 Heh, so fascinating that I totally did their little quiz thingy and got this cute certificate. After the War of 1812, the flag remained in the possession of the Armistead family (the husband was fort commander)...and over time, they would give away pieces of the flag as souvenirs or remembrances to people. 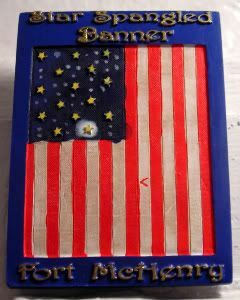 That's why there's a star (the white halo'd one on the magnet) and about 8 feet of flag missing. You'll also see what they believe is a little red A sewn into a white stripe - sewn onto the flag by Louisa Armistead, the commander's widow. Still, if there's one thing I love about this country, it's our recognized need to preserve our relatively short history. And this flag is no exception - the Preservation Project shows how workers have toiled painstakingly to help this national treasure survive. You think you tear up now, when you hear the below words being sung? I promise, the below words will take on so much more meaning once you've visited both Fort McHenry and the Star-Spangled Banner in DC. Happy Flag Day! 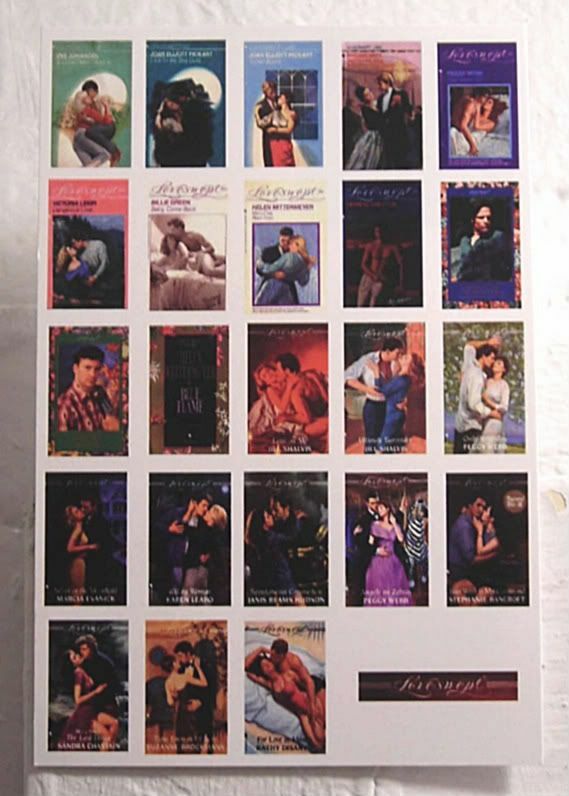 I'm actually doing a magnetpost on Harlequin romance, using a magnet that I made. Whoa. Anyone who knows me knows my long-standing frustration with Harlequin series relying on the salesability of formulaic brides, babies and cowboys stories. So. What am I doing? I'm giving credit where credit is due. 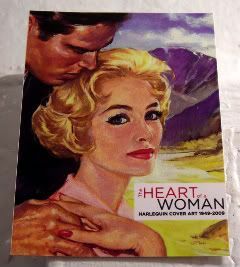 In honor of their 60th Anniversary, the Harlequin folks put on cover art retrospective downtown. It was a small exhibit, at OpenHouse Gallery, but I really enjoyed it. I'm only sorry I went on the last day, I probably would have gone back again to spend more time reading the copy that went with all the art. It was well put together, wonderfully thought out and designed, and the copy was just terrific. 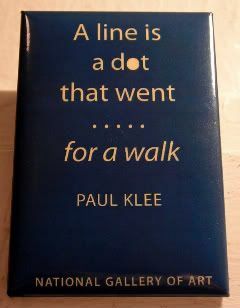 It was like reading good cover copy, in fact, it was actually better than some cover copy I've seen running around. They went chronologically, managing to artfully map out a great timeline that was representative of the history of the genre allowing the artwork to mirror our country's history, as well as (ironically) the feminist movement. From their early gritty suspense novels written by men, to the soft-spoken quiet novels of deep, abiding love, from the damsels in distress to women in the workplace, and from the doctors and nurses, to the Fabio historicals, it was pretty damn cool. See? I can be complimentary. They really concentrated on the cover art, the full paintings...but they didn't pair up the paintings with the actual cover of the book to give it context. It probably would have been a pain to pull each book, but it would have been nice to see the cover design evolution as well. 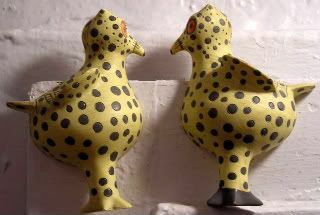 They concentrated only on the Harlequin books, not any of the Silhouettes, that I could tell. Though maybe that's because I couldn't see the cover design that I didn't know which series the art belonged to. And finally, they held it in New York City. In SoHo, no less. Really. How much of their demographic lives here, and what tourists can easily find it, without having to go off the beaten tourist path? Honestly, I might have thought twice about going, were it not for the lure of Rice to Riches on the next block. I'm just sayin'.But overall, it really was a great exhibit. Though, to be fair, even with my publisher issues, I will admit to growing up reading Harlequins and Silhouettes, all the way back to their Silhouette YA line. They really do have some fantastic writers who can tell really good stories. In fact, I have a stack of them at home that are double-starred on the spines as ones to keep and never give away. There's the Intimate Moments that I managed to do a 10th grade book report on (to the surprise of my teacher, when she learned it was a romance). The hero was Grant Sullivan, and he and the heroine (no one ever remembers heroine names - hehe) are traipsing through the jungles of South America, trying to get to safety. There's the Harlequin Presents with the chick who had an accident and went blind, and had to go to a special clinic to learn how to be blind, and she fell in love with her doctor. There's the Harlequin Presents with the nanny who went to live in the big mansion to take care of the two little kids, and their father, who fell deeply in love with her, despite her shady past. There's the American Romance about Corey, the race driver, who gets hit by the heroine who was hazily under the influence of expired cough syrup. Of course they fell in love...even though she was scared to death each time he raced. Mind you, I think it's quite funny that I can't remember a single Silhouette Desire (the direct competitor to my Loveswepts) cover. I know I read them. I must have. But no matter what, with each paragraph I just typed above, 20 years later, I can clearly see the cover art of each book in my head, even if I don't remember the titles or the authors. Which all just goes to show the true power of great cover art. Oh! I forgot! Pictures from the exhibit. ...coming here with your face!" I promise. This is the last Hayley Mills movie in the marathon. C'mon. How could I not use this magnet for Parent Trap? Plus, honestly, how can you talk about Hayley's Disney movies without talking about Parent Trap? I used to wish for a twin. A twin who had my face that I'd find when I finally got sent off to that camp halfway across the country. A twin who had my face that I'd find when I finally got sent off to that camp halfway across the country, who had been living with my other set of parents this whole time, and OMG, you look like me, I look like you, and oh, how happy now we could be, Together! Ummm, yeah, that never happened for me. Still. I freakin' adored this movie. And the sequel with Susan and Sharon as adults, with Tom Skerritt as the leading man. And the next sequel with the Creel triplets (whatever happened to them?) and the I'm Always Chasing Rainbows song, with Barry Bostwick. And the sequel to that sequel, where they do the requisite honeymoon. In Hawaii. Anyway, I don't know a living soul who hasn't seen the original Parent Trap, so I've said my piece. You'll laugh, you'll cry, you'll laugh again. You might even get goosebumps! 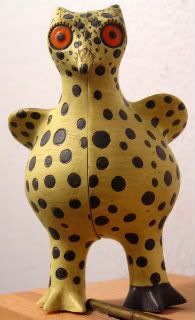 In case you're wondering, this little guy is a Zuni Owl effigy vessel, pottery from the Zuni Indian tribe of New Mexico. The real one's sitting at the Brooklyn Museum of Art, even though I bought this at the Met, and therefore haven't seen him in real life. He's supercute, a Magnerine, just one of my growing collection that's amassed since the last time I blogged about these supercool magnets. totally reminded me of Hayley - particularly in this (wrong movie, but right pose) LIFE cover. Right at this moment, my sisters (who unpacked the DVD out of moving boxes) are now re-watching Moon-Spinners for the thousandth time, and I've hit pause on Summer Magic, to write this post. I certainly didn't intend for this to be a Hayley Mills mini-marathon, but who can resist the call of Beautiful Beulah, Maine, and the wonderful, oh so cheesy Carey family of Summer Magic? There's the ever-so-put upon widowed matriarch, Margaret, placed in reduced circumstances, mother of willful daughter and consummate dreamer Nancy, ragtime pianist son, Gilly, and impish son, Peter, who sleeps every night with the Shaggy DA dog. Nancy (who has the cutest dresses, with the wrongest hairwear) has convinced the affable Osham (?) Popham (played by the affable Burl Ives) to let them live in the gorgeous abandoned yellow house in the outskirts of Beulah, and it's all about how the Bostonian Careys get used to living in the countryside (because really, who needs money, in the land of milk and honey)? Ok, ok, the story's way too complicated to get into, but suffice to say that there's a happy ending. Of course. Hello, it's Disney! Also? Being Disney, it has several musical numbers that won't leave your head - apparently ever. For serious, yo. I'm seeing tonight that on top of quoting scenes, I can still sing along for every freakin' number... Good. Grief. Overall the movie tends to hold up ok - mostly because even though it was released in 1963, it's set in the early 1900s. I won't lie, some of the songs are pretty FF-worthy - particularly when they're just montages of the countryside and the flora and fauna of said countryside. Some of them are just toe-tappin' fun. Yeah, you read that right - I said toe-tappin' fun. You'll see below by the lyrics of Femininity, some of the songs are pretty darn offensive to our modern-day feminist sensibilities. But, scored right, and yeah, I'll be singing this song all the way to work today. Heh. You're still here. Go. Watch! Oh! I forgot! I've never been to Maine, either! Save the World Sister got me this magnet while hiking in Maine. Huh. Now there's a question. I wonder why comes it's "trekking" when you're in Nepal, but it's just plain old "hiking" Stateside. When I was growing up, whenever we had kids come visit - particularly girls - my mom would bust out the Betamax, and later, the VHS, tapes of old Hayley Mills movies from Disney. Don't know Hayley? Of course, you do. She's the daughter of Sir John Mills, the goddaughter of Sir Noel Coward, and the darling of several Disney movies, including The Parent Trap, The Castaways, Summer Magic, That Darn Cat and Pollyanna. Seriously. 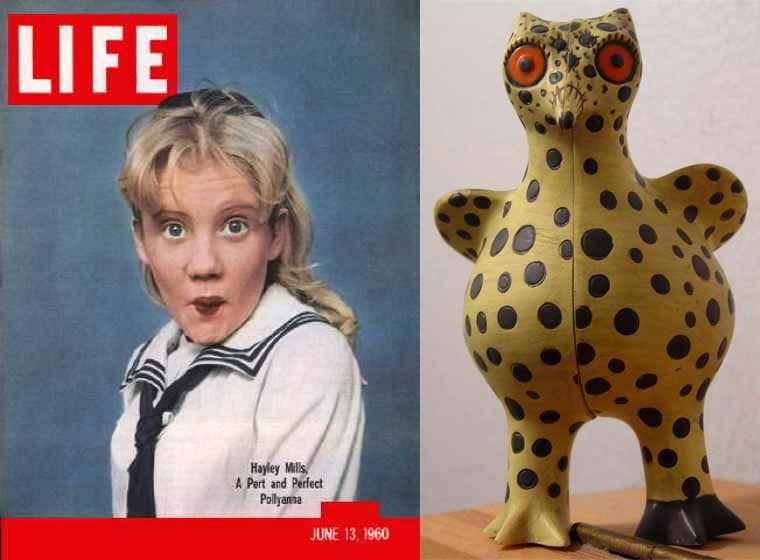 My mom had the Hayley Mills oeuvre nailed down. I could go on, with the lesser-known The Trouble with Angels, Truth About Spring, The Chalk Garden, and Flame Trees of Thika....or still even more obscure Good Morning, Miss Bliss, the precursor to Saved by the Bell. You wouldn't believe the hours we spent with Hayley growing up. Well, no, actually, you've probably gotten an idea, so far. But, if you're paying attention, you've noticed that I left out my favorite Hayley Mills movie of alllllll time - The Moon-Spinners. You must see this movie. Must. Filmed on location, it was a mystery/romance with a teenage Nikky Ferris coming to picturesque Greece on holiday with her doting Aunt Frances. No sooner than they check in to the lovely Moon-Spinners inn, than Nikky manages to bumble her way into a murder and mayhem, complete with a jewelry theft ring, windmills, a strange innkeeper named Stratos, weird little sidekick named Alexis, and superduper cute mystery man named Mark Camford at the center of it all. Oh, and don't forget the eclectic Madame Habib, with her exotic pet! Goodness, you couldn't get more romantic than that! Go. Why are you still here? Oh! The second I saw this magnet, I knew I had to buy it, because I'll always think of this movie when I think of Greece. Ummm, yeah. 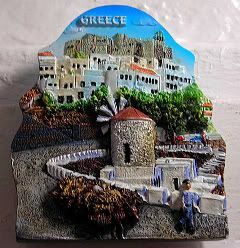 I've never been to Greece, so I suppose it loses a bit of its romance if I admit that I bought this in Tarpon Springs. Florida. Heh. Hells, yeah. I totally made an incredibly dorky, but (for me) oh, so loveable magnet of my masthead. What? Like you weren't expecting it at some point down the line. At the urging of quite a few people, I went ahead and made them. Feels like it was something kitschy that needed to be done. I figured that since I bought the domain, I needed something to celebrate. Plus, oddly, it feels like I needed something to hand out whenever I mention this silly blog. Of course, now I'll actually have to pass them out, I suppose. So, yay. And, yes, I'm totally sending them around to friends and family, at some point, no worries. Heh. Theme weekend! 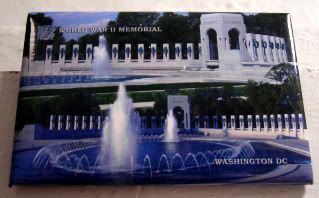 I was going to use this World War II Memorial magnet for Memorial Day, but this D-Day weekend works just as well, if not better. This year marks the 5th anniversary of the dedication of the memorial, built to honor the 16 million who served during WWII, the more than 400,000 who died, plus the millions more here at home who helped in the war effort. It's one of those things where you wonder why it took almost 60 years before a national memorial was built for the WWII veterans. The truth was that there were dozens of local memorials, but nothing on a national level. Then, the right veteran wrote the right letter to the right member of congress, and the rest is history. And, it's a fascinating history - American Battle Monuments Commission couldn't build the memorial without the funds to build and maintain it in perpetuity. What'd they do? Raise twice as much money as they needed. They needed someone to help drive the fundraising, what happened? Tom Hanks mentioned the memorial during an awards ceremony and money started flooding in, and he became the national spokesperson, with a couple of commercials telling everyone that it was time to say thank you. The design itself is as fascinating a story as its history - again one of those stone memorials that say so much. The design of it is quite intricate, from the two pavilions - one for the Atlantic and the Pacific, to the pillars for each state, to the incorporation of the existing rainbow pool, and the Freedom Wall, a field of 4,000 gold stars, representing the 400,000 that were killed. There's also the bronze eagles and wheat, and inscriptions, and bas reliefs, and I could go on and on. Luckily, someone recorded a tour! Whoa. Dedication weekend 2004 was amazing - it ended up being a four-day Tribute to a Generation, with concerts and ceremonies around town, and presentations and exhibits on the Mall, all culminating in the dedication of the memorial. It's so funny, though I worked on the advertising team for the memorial, I didn't go down to help out with the dedication team. Instead, my sister and I volunteered for the Smithsonian's reunion weekend, which was even more fabulous than I could ever have thought. It was the largest gathering of the World War II generation before or since. One particular tent we worked in was the Reunion Hall - it's where all the vets could come in and hang out, sharing stories with each other and with the volunteers. But best of all, they could post notes for men/women in their battalions and fighter groups and bases, or whatever designation they were seeking. Meet me here, are you still alive, would love to talk and catch up - some of the loveliest notes. And watching them reunite with hugs and tears in their eyes after so long was just the best thing - ever. 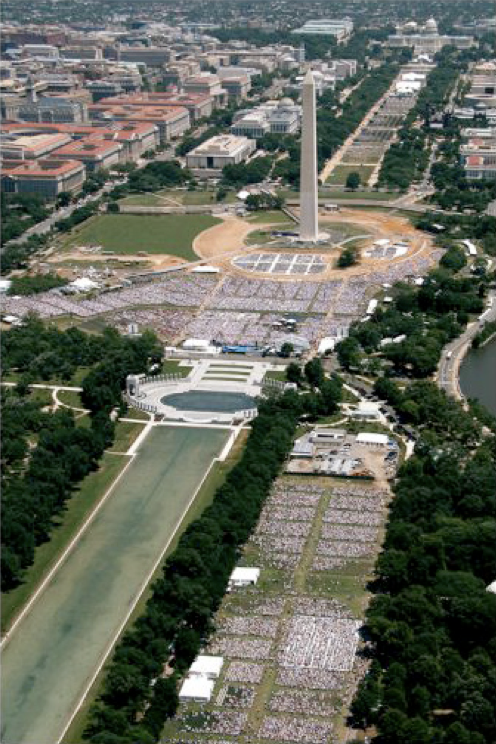 Smithsonian photos are here, but here's a fantastic aerial shot of the ceremony, where you can see all the way back to the stage toward the Capitol. Still to this day, it's one of the best weekends of my life. It just made you want to thank everyone in uniform everywhere. So thank you. Later that year, my parents went to visit it, and according to my sister, as my dad (a baby boomer born at the tail end of the war) was walking around, someone came up to him and said very somberly...thank you.